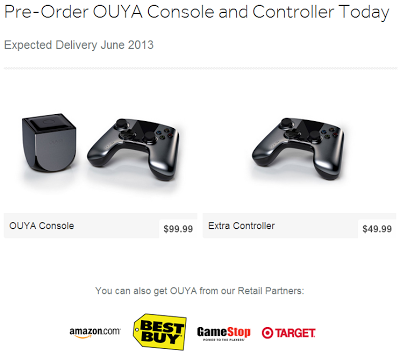 OUYA's will be available from some big stores too! Ahh, the OUYA! It feels like an eternity since we offered our money in the hope we would have an Android powered games console which would double as a home entertainment system and anything else we could hack on to it, way back in August of last year! 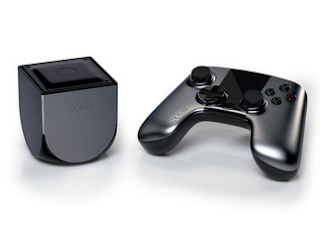 As the judgement day in March draws ever nearer everything is starting to fall into place and, dare we say it, OUYA is starting to look like a genuinely competent and forward-thinking company! This morning backers received an email saying that after KickStarter pre-orders have been fulfilled people will be able to pick up OUYA's from a few big stores. Normal customers will be able to buy the consoles and controllers from Amazon, GameStop, Best Buy and Target! At then moment we're not sure whether those places will only have on-line availability or whether you'll be able to pick one up in a brick and mortar store. Either way, if you're genuinely keen you can pre-order an OUYA now from either Target or Best Buy and it'll cost you $99 for the system and one controller and then $49 for each additional controller! Only problem with that these pre-orders won't turn up until June, whereas KickStarter backers will get there's in March. If you aren't a backer then you can see the update which, as always, is also posted on the KickStarter page here!